What is the difference between a bossy guy that makes you growl with anger and a bossy guy that makes you purr? Well… the purr-inducer is a paranormal hottie that doesn’t know any better. He doesn’t “get” us modern women and he just can’t help his bossiness. Hundreds of years (thousands?) spent in torture, with out love will do that to a guy. Oh… and he’s irresistably intense. The reminder stung. “A moment of insanity,” she whispered, looking down at her hands. Her fingers were intertwined, the knuckles white. I will say, THIS series has probably been the one most recommended to me, since I’ve started reading the genre. Why have I delayed this long? I honestly don’t know. I had a feeling, once I started, I’d probably be enthusiastically in for the long haul, but I waited. I read stuff. Some stuff that I will love forever. Some stuff that I feel wasted my time. I have a feeling this series (yes, I’m only on book one so I may be jumping the gun here) will end up on my top ten paranormals list. I have a fun ride ahead of me don’t I? And Lily did get my enthusiastic “quick version” story recount. You know when I feel the need to tell her about it, even though I should be working instead… it was good! Oh, and my husband got a dose of it too. Why do I keep telling him these stories? It’s not like he’s gonna *like* ’em, like I do. I swear it makes me giggle how much he rolls his eyes when I tell him all the good parts. I must like to punish myself when I insist he understand that “it’s not as bad as it sounds”! Many of you already know all about the series, so you all can laugh at my “newbie-ness” (but please so do so in the comments so I can giggle, too), and for those of you who are new to the series too, let’s read it together!! Long story short. Male “guardians” to the Greek Gods were bein’ all pouty once, when they found out that a female Guardian ( *gasp* the horror!!) “Pandora”, was left in charge of protecting a certain demon-holding box. To teach the Gods (and her) a lesson, they snuck in and released all the evil demons imprisoned in that very box. Stupid men!!! Paranormal or not, they make some pretty dumb decisions sometimes. They’d only thought to teach the gods a lesson the night they’d stolen dimOuniak from Pandora and released the horde of demons upon the unsuspecting world. How foolish they had been. Their plan to prove their power had failed, for the box had gone missing in the fray, leaving the warriors unable to recapture a single spirit. ‘Cause well… they couldn’t get the demons back in there. The evil demons were wreaking havoc all willy-nilly everywhere, and as the demons were collected, instead of going back in the box, the Greek Gods decided on a punishment. Each of the pouty Guardians were to host one of the demons. In their own body. Forever. So now there is a skilled, human society (The Hunters) that are out to get these “Guardians” and rid the world of their evil. Through time there have been battles and bloodshed with these “Hunters”. But now, in modern times, the Guardians simply want to reside in their castle in Budapest, to live their lives in peace, while they each struggle with the tortures of these different demons. In return for their quiet lives, they provide the people of Budapest with money, and protection. Because you know, all in all, they’re “good guys”. Okay, now about this book: There’s this sweet inexperienced female – Ashlyn (tiny and human) that has a strange ability to hear conversations from the past. Anywhere she is, any conversation that has ever taken place. Good or bad. She hears them all. Non stop, since she’s been a child. It drives her crazy. She was raised in a scientific institution that studied her (not much love and affection there), and she aides them in their paranormal research. She’s lead them to vampires, goblins, and all the rest. In their Budapest travels, she has heard many conversations regarding the “angels” and some would even say “demons” that live on the hill, and their ability to aid so many. She decides to trek up the hill (all by herself, late at night 🙄 ) to ask if they can help her control her “abilities” so she can finally get some peace. On her way up, she bumps into one of ’em (Maddox). He is one of the strongest warriors (he hosts the “Violence” demon). While she is in his vicinity, all of the voices become silent (as if they fear him). She is finally at peace. In that moment, she forgot her fear. How could this man be possessed by a demon when he came with such lovely quiet. Demons were a source of torment. Not peace. Was he an angel of mercy, then, as the locals assumed? But he just wants her to go home and leave them alone. They do not trust anyone that tries to approach their lair (due to the “hunters” and all their ploys). That, and well, she was followed up by some of those very “Hunters” and now he has to kill ’em all (with her stuck in the middle). And as he starts back, the voices start bombarding her again. She runs after him and clings to him. Begs him to take her with him. Yup. She begs *cringe*. “I’m not going back. Wherever you go, I’ll follow.” A threat, yes, but one she intended to uphold. But he can’t. Cause he’s gotta go to Hell. As he does every night at midnight. Poor guy. Yup. Every night, as part of his curse and punishment, he gets stabbed to death, six times by his best friends, and burns in hell until morning. Then he wakes up, lives his day, and starts all over again. And guess what. It’s near midnight, and she’s clinging to the leg of a very angry demon that’s on his way back to a night of torture. and when she doesn’t heed it, he throws her over his shoulder like a sack of potatoes, and heads back to his lair. He has no time to argue. He needs to get back as Hell awaits. She’s a permanent part of their puzzle now, and nobody, not even Maddox, knows what to do with her. This is a story about how an inexperienced human girl, learns to cope with something she should have left well enough alone, and how one of the angriest Lord of the Underworld guys deals with her creeping into his heart. One that he thought no longer existed. Nice. Very nice. Okay, sometimes a bit *eye rolling* but mostly sigh inducing. I hated him… and loved him. And while she was a bit (okay, a lot) clingy and not very assertive, if you make a point to not take it too seriously, you can really enjoy it. 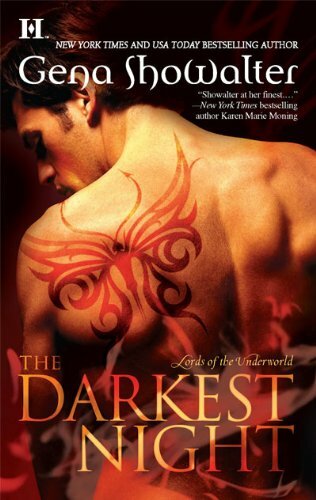 This has a very BDB-ish feel to it (BDB-ish = Black Dagger Brotherhood). A band of immortal “brothers” who each have their own cross to bear. They love and hate each other, and suffer together. They fight with each other, and for each other. A nice look into how an angry, tortured no-nonsense group of immortal half demon/half guardian lords deal with the intrusion of this new female (and their complete bewilderment, when one of their toughest succumbs to this mere mortal woman). All sense of logic – out the window! Oh and, there’s other stuff too. Like more Hunters. And curses. And mistrust. And another group of women that suddenly become a part of it all – and a little side (possibly love?) story to go along with it. They still befuddle me, but book #2 is sure to expand. These are great books, I really feel bad for these guys even though you want to smack them for opening the box! Gena writes great characters too, I think she’s one of only a couple of Authors I would buy her stuff without looking at the storyline first! You know I love this series, and I can’t wait for you to meet *my crush*, I’m sure, soon to be your crush too 🙂 AND, I won’t let it slip this time before you get there 🙂 But I’m glad you’ve started them!!! I can’t believe you’re just getting to this series!!!! I loved it! You’re not going to be able to stop. In fact, you make me want to read them again! You will totally enjoy the entire series! Oh you guys have me so excited!! I can’t wait to get home tonight so I can read #2!! Sheeeesh… and I thought Maddox would be unbeatable in crushworthy-ness. I’m a little apprehensive about the cutter. As much as I love vampires… this guy’s a little *ew* bloody-wise. But, I still can’t wait to read him. Oh you going to love the cutter! He is so easy to fall in love with! I think I loved him the most! The only book that I thought from this series was so-so was the angel of death’s story. It was eh, but…. It picks up again after that one! Enjoy! I am totally making this series next on my list to read! Honey, these are by far the BEST books EVER!!!! Wait until you read the rest!! PHEW! I SWOON for the Black Dagger Brothers (Tohrment especially), these, however, seem to just now begun to pick up speed. Just found your blog, awesome! Oh, Maryse, you don’t know what kind of ride you’re in for. Even though you’ve only just completed the first book in this indescribably good series, you have no idea that “goodness” that lies ahead. I can’t wait for you to get all caught up. And, after you breeze through the series (I dare you to try and stop reading), you’ll have to let us all know who your favorite Lord is. As for me, I’m torn between Pain, Lies and Paris (of course). There is also another that I love, but I am hesistant to mention him just yet. Ohh, I’m so excited on your behalf! This series is really, really good and so worth reading — again and again and again! But that’s just what I do! No wait. I still love Maddox’s intensity the most. When he loves… boy does he LOVE.